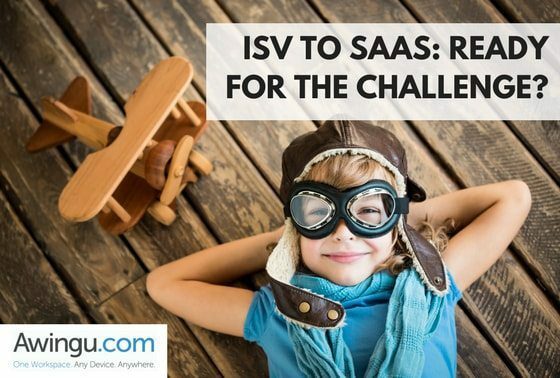 ISV to SaaS: Ready for the challenge? ISV`S TRANSFORMING TO SAAS: READY FOR THE CHALLENGE? Today with cloud computing, every segment of the technology industry is changed dramatically and ISVs are no exception. Not so long ago, buying software involved a high one-off purchase cost for a solution that you could install on your local computer or server. With more companies preferring to use SaaS applications rather than deal with the time and expense of implementing and maintaining on-premise software, ISV`s are transitioning from an old model of packaged software to SaaS. SaaS comes with added value, it`s browser-based and constantly evolving. For many ISV`s this process is still at the early stage, as the transformation of legacy on-premise code and existing architectures turn to be pricey and complex. Added to that the changes required for sales models, service delivery, sales training as well as marketing strategies, and the road from an ISV to a service provider becomes difficult with numerous obstacles. Ability to address a wider target audience: addressing entirely new markets, or expanding into different regions. Application development: making your software browser ready, constantly upgrading customers to the latest version, optimizing the software for scale, etc. It`s important for companies to understand how the transition to SaaS affects more than the strategy, organization and operational aspects of your business – it’s a deep change from providing a product to providing a service. With many stepping stones along the way, a trusted partner that understands the challenges is the best place to start. RUNS IN ANY CLOUD: You are in control of the technology used and the margins generated. The transition from ISV to SaaS provider is not necessarily an easy one, but well worth it in terms of market opportunity and the potential for growth. Don`t think twice, we are here to help you! Check out how Awingu helped two ISV`s to move to SaaS, one for B Rekencentra and another case of Infodidac, a company that created a school administration software. Contact us if you have questions or try Awingu for 14-days for free!